Smart Material distributes stack actuators manufactured by Ceramtec AG, Germany. 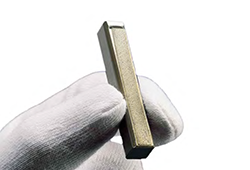 Monolithic multilayer actuators (stack actuators) are comprised of up to 500 layers of piezo ceramic material, which is only 0.1 mm thick, manufactured by using a specially developed and patented stacking and sintering technology. 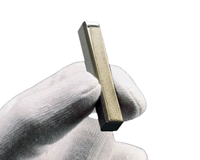 Stack actuators can produce very high forces (several kN) within a very short period of time (a few μs). The associated acceleration rates can destroy the actuator. Thus, if an unrestrained charged actuator is short-circuited, it will contract faster than its inert mass is able to follow. The actuator could immediately disintegrate! A mechanical pre-stressing device is therefore necessary to limit damaging tensile stress. Even in static applications, a pre-stressing force of approx. 50% of the respective blocking force is highly recommended to stabilize the mechanical assembly and to increase lifetime. In terms of electrical properties, actuators resemble large capacitors. Their capacitance depends on the temperature and on the voltage applied. The low-signal capacitance we measured at 1V and 100Hz may double under real-life operating conditions (120 °C, 200 V). In pulse mode, charging currents of up to 50 A may be encountered. Electronic control circuitry must be designed to be able to handle these characteristics. The displacement of an actuator follows the received charge(Q) with good linearity. Therefore the flowing current (I = dQ/dt) is an equivalent to the velocity of the actuator endplates (v = ds/dt). The steepness (slew rate) of fluctuations in the current (dI/dt) are then equivalent to the acceleration (a = dv/dt) of the actuator endplates. Voltage controlled switching amplifiers often destroy actuators by sending bursts of charge causing extremely high acceleration rates. We recommend the use of slew rate controlled amplifiers or at least a strictly limited output current. The power dissipation rate can be significantly reduced by operating the actuator in resonance with the driven mechanical assembly. In this case, a small control voltage will result in a high stroke amplitude. Thus, if the configuration has a mechanical Q-factor of 10, which corresponds to that of a “normal” mechanical lever system, the rated actuator amplitude can be achieved with as little as 20V. Power dissipation will remain low even at high frequencies (several kHz). If mechanical power is drawn from the system, damping will occur. This results in a reduced oscillation amplitude and a shift in resonant frequency. Therefore, the power output of such systems is limited. This operating mode is being used successfully in many applications. Actuators should not be operated above the resonance frequency of the actuator and the driven mechanical system.